Will trade win China the battle for supremacy in Asia-Pacific and the Indian Ocean? 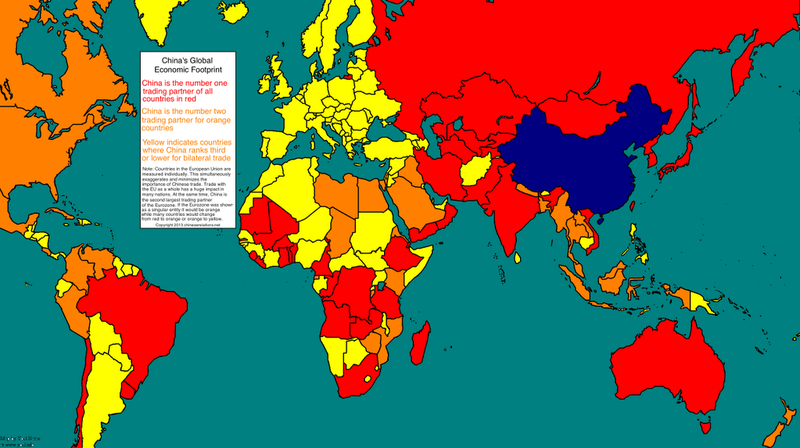 China is the number one trading partner for all the countries in red; and number two for the countries in orange. This image reminded me of Gowa and Mansfield (1993); and got me thinking about whether trade links (and associated opportunity costs) would ever matter in the choices to take sides of the two European offshoots in Asia-Pacific (and Japan) if stuff ever hit the fan in Sino-American relations. But then again that might not happen any time soon since China is already America’s No. 2 trading partner, and the US is still by far the strongest super-power the world has ever seen. By a massive margin. That said, the Great War is still an important cautionary tale about the dangers of getting all giddy and complacent about the end of Great Power wars on account of trade and global interconnectedness. Let’s hope that power transition theory will not apply to the case of Chinese economic (and military) rise to rival the United States of America.